This entry was posted on October 1, 2016 at 2:35 pm and is filed under Adventure, Science Fiction. You can follow any responses to this entry through the RSS 2.0 feed. You can leave a response, or trackback from your own site. I’m glad you found it so visually impressive. Aside from the skeleton scene and the underwater scene it did nothing for me. Especially the Florida sequences. It had none of Burton’s skewing of suburbia. It all looked pretty ordinary to me. As you know, I found this film a slog. One of my least favorite of the year. Every character just explains the magic instead of showing it. 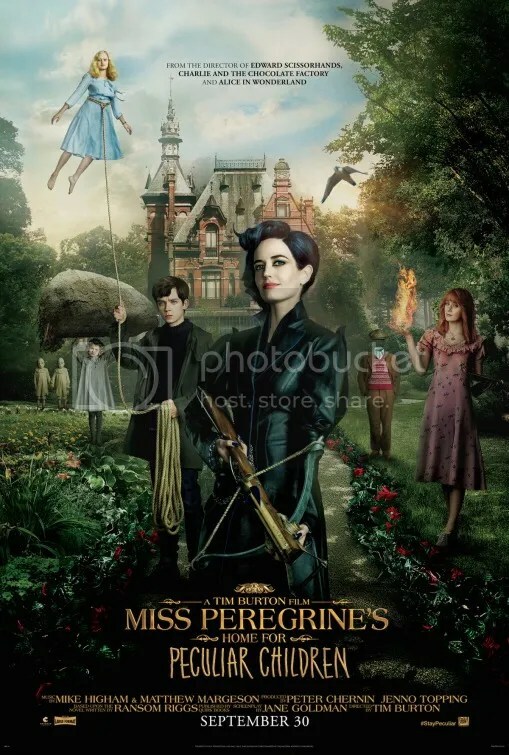 The peculiar children are hardly in the movie at all except for the blonde girl and Jake is completely bland. Not for me but glad you were entertained. Oh my gosh, you’re making me appreciate this film even more! I didn’t even mention the skeleton soldiers. That was like something out of Jason and the Argonauts. Ray Harryhausen would have been proud. What a wonderful homage. As you mentioned, the underwater air bubble scene was definitely cool and then later when Emma expels the ocean water from the ship, I was dazzled by that image too. The children had fascinatingly grotesque abilities. That little girl with shark teeth on the back of her neck was especially bizarre. I knew the bee-hive boy had that peculiarity because they had already shown it once, and yet every time he opened his mouth, the way the bees flew out surprised me. The Hollows kind of looked like a cross between a giant Cthulhu and Slenderman. So imaginative. I’m sad you weren’t captivated by all this creativity. Oh well, I felt the same way about Star Trek Beyond so I understand exactly how you feel. Hmmm well I already felt the movie was too long. I didn’t need it to be longer with more focus on the side characters. Ha! Perhaps we’re getting off the subject, but I always found the Quidditch match in Harry Potter and the Chamber of Secrets to be interminable. I get your point. It’s just that sometimes “showing” can be pretty awful too. Yeah perhaps bad example because I hate quidditch. I guess fantasy has never been my favorite even when I was a little girl. If I don’t emotionally connect with the characters or the script doesn’t make me laugh than there is little hope. Like early Tim Burton I do connect emotionally and laugh/cry with the script (Edward Scissorhands, Ed Wood, Beetlejuice). I agree that based on Burton’s track record, he seems ideally suited to make Miss Peregrine’s Home for Peculiar Children. Not surprised to hear that the film is visually gorgeous, since the it sounds like the kind of unusual story Tim Burton knows how to tell. Also not shocked to learn that the film’s villain is poorly defined. I got that sense from the trailers I’ve seen. Samuel L. Jackson is usually enjoyable to watch, although unfortunately he does tend to end up playing one-dimensional villains. I blame that more on poor writing than anything he does wrong. Bummed to hear that the movie drags in the 3rd quarter and that it lacks a coherent narrative. Still, from your description it sounds entertaining enough that I should check it out. The script is definitely a weakness too. I really didn’t like the novel so I am not sure I can be bothered to see this even though I have always enjoyed Burton’s aesthetic. If you didn’t enjoy the novel, I doubt the movie will charm you. But you never know. It WAS fun! I thought Eva Green’s performance helped lighten the mood.